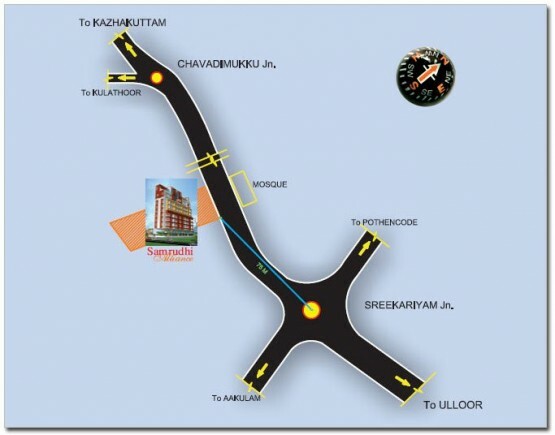 Situated at one of the most sought after locations in Trivandrum, It is connected with the very heart of the city. Artech Alliance is located at Sreekaryam Jn. and is in the vicinity of major Schools, Colleges, Malls, Hospitals, Airport and Technopark. Artech Alliance is yet another masterstroke from the master builder. The project consists of two commercial floors and nine more floors of immaculately built apartments. Each floor contains 3 apartments. In short, only a select few will have the privilege to call this landmark their home. Quality Teak wood front door. Attractive Internal doors Aluminium casement windows including grills and fully glazed shutters. Reticulated gas Connection. Kitchen counter with granite top and stainless steel sink Ceramic tiles above the counter to a height of 60cm. Ample storage space. Flooring & Dadoing to a height of 210cm with Designer Ceramic tiles. Concealed piping, light colored sanitary fixtures and C.P.fittings Hot and Cold mix tap with shower. Provision for geyser connection and exhaust fan in all toilets. Independent three-phase wiring including ELCB & MCB, 2 light points and one fan point in each room, Exhaust fan provision in kitchen and toilets, Switches-Modular type, 5 nos. (5A socket in each apartment, 2 nos. 15A socket in each apartment), Provision for TV connection, Provision for washing machine. Provision for internet connection. Concealed conduits for telephone in Drawing and Master bed room. One passenger lift & a ‘stretcher’ lift. Generator back-up for lights,common lights, water pumps etc. Selected points in Apartments viz: one light and fan point each in the living and master bedrooms and a T.V. point in the living room.